Just a short a note to welcome the new CGSC class 2018, Staff Section 19, to the blog. As I have said in class, the purpose of this blog is to continue the discussion of the class room topics in another venue. I will be posting a class specific blog entry for each class . Anyone in the class, actually anyone –other CGSC students as well anyone from the public, military or civilian, not affiliated with CGSC –can comment on what I post. I do not plan to edit in any way the comments on the posts. However, in the extremely rare case where someone might spam or flame the comments sections, or post anything I deem inappropriate, I will edit those out. The blog guidelines posted on this page should be considered before posting. If you have something to say relevant to the class that you want to express that does not go directly to the lead in blog, feel free to add that in the comments section as well. In other words, the topics are not limited to the subjects I suggest, but are limited only limited by what is relevant to our history class and your CGSC experience. A recommendation: be aware of your writing style and grammar in your comments. Like any public writing, including email, people will judge you by how you write as well as what you write. I won’t be concerned about your style –but it is just natural that others will. Do what I do –write your blog comments in word –spell check and proof read them –and then post them. Its not a big deal, but it is an opportunity to practice good communications habits. Again, welcome to the blog for AY 15 and have fun! Use these rules as a guide when posting. Just a short a note to welcome the new CGSC class 2015, Staff Section 7, to the blog. As I have said in class, the purpose of this blog is to continue the discussion of the class room topics in another venue. Just a short a note to welcome the new CGSC class, Staff Section 17, to the blog. As I have put out in class, the purpose of this blog is to continue the discussion of the class room topics in another venue. I do not plan to edit in any way the comments on the posts. However, in the extremely rare case where someone might spam or flame the comments sections, or post anything I deem inappropriate, I will edit those out. If you have something to say relevant to the class/topic that you want to express that does not go directly to the lead in blog, feel free to add that in the comments section as well. In other words, the topics are not limited to the subjects I suggest, but are limited only limited by what is relevant to our history class and your CGSC experience. If you are interested in “guest blogging,” that is begining a conversation in this space on a topic related to class that you are interested in, see me for how to do that. 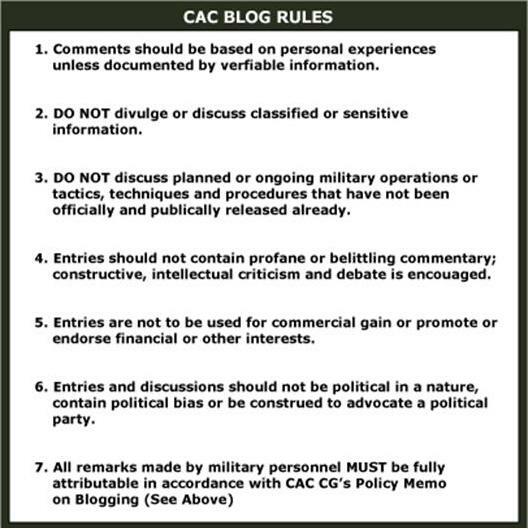 Note that occassionally there will be posts to this blog which are not directly related to the History curriculm, but do relate to either the purpose of the history instruction, to use history to promote critical thinking; or to the overall purpose of critical thinking; or promote to development of your military professionalism. Those posts are open for comment and will be considered just as all the other posts are. A recommendation: be aware of your writing style and grammar in your comments. Like any public writing, including email, people will judge you by how you write as well as what you write. I won’t be concerned about your grammer and style –but it is just natural that others will. Do what I do –write your blog comments in word –spell check and proof read them –and then post them. Its not a big deal, but it is an opportunity to practice good communications habits. First blog(s) for AY 14 are published below. Again, welcome to the blog for AY 14 and have fun! 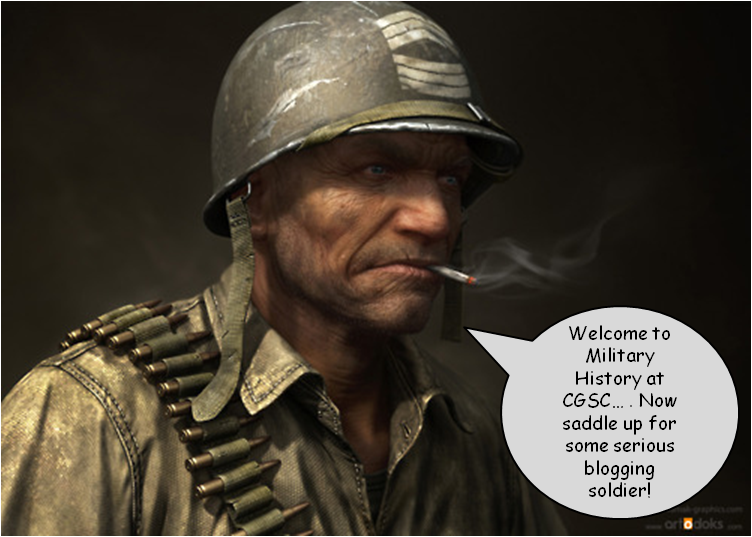 Just a short a note to welcome the new CGSC class, Staff Section 11, to the blog. As I have put out in class, the purpose of this blog is to continue the discussion of the class room topics in another venue. Again, welcome to the blog for AY 13 and have fun!